Inder Loves Folk Art: Scrap basket comforter for my Mom. Scrap basket comforter for my Mom. First of all, thank you, everyone for your sweet and thoughtful comments on my last post! I'm sorry I haven't responded to everyone yet, but your words mean so much to me! I love my blog friends, y'all are the best! Truly. I hope you all had a wonderful Christmas, if you celebrate, or a wonderful winter holiday otherwise. My house is knee-deep in kid detritus and my children are super spoiled! With everything so gloomy in our house, I might have gone a bit overboard with the Christmas cheer, ahem. I always say I am going to go more minimalist with Christmas - less crap, less toys - but then I totally fall apart once I start shopping, and I end up buying all. the. things. for my kids. Their excitement is so contagious! I know I'm not alone in this weakness! Then, after I went totally overboard, my brother went totally overboard too, and yeah ... serious American first-world gluttony over here. But it was fun! With the stressful turn this holiday season took, my plans to make multiple handmade gifts had to be narrowed down. And narrowed down they were - I made exactly one handmade gift this year. A little comforter/quilt for my mom. My mom has had a tough few months - her lease was terminated when her landlord decided to remodel and list the house she had been living in for many years. Since she lives in a college town in the Pacific Northwest, the timing was as bad as it could be - it's really hard to find a nice rental in October and November in Bellingham, Washington. Luckily, she and her husband found a new place, sharing a house with a nice lady, "at least for the winter." You don't want to be looking for a new place in the dead of winter anywhere, but especially not in the darker Northern latitudes. I'm glad my mom has a warm place to spend the winter and hopefully beyond. Anyway, because of the expense of moving, Mom wasn't able to come down and spend Christmas with the family as she usually/often does. That was a big added sadness for her (and for us as well!). So I wanted to do something really special and cozy for her, hence this little blanket. To piece the top for this quilt, I raided my scrap basket for yellows, browns, reds, and blues, and turned four inch squares into little four-square blocks, pairing deeper colors with low-volume prints. Then I arranged them on my floor and moved things around until I liked the general look of the arrangement. The four-square blocks are all arranged with (relatively) darker fabrics going from top-left to bottom-right, creating organic diagonal lines down and across the quilt. As usual with scrap quilts, half the fun was seeing how a random bunch of scraps look together in a quilt! This quilt was interesting in that it seemed to look better in photographs than in person - I think the photographs helped me see it "from a distance," when the colors blend in a lovely way. Up close, the individual prints take the stage. I was going for something homely and homey and cheerful that reflects my love for folksy utilitarian items (Inder Loves Folk Art! ), and I think I achieved it! 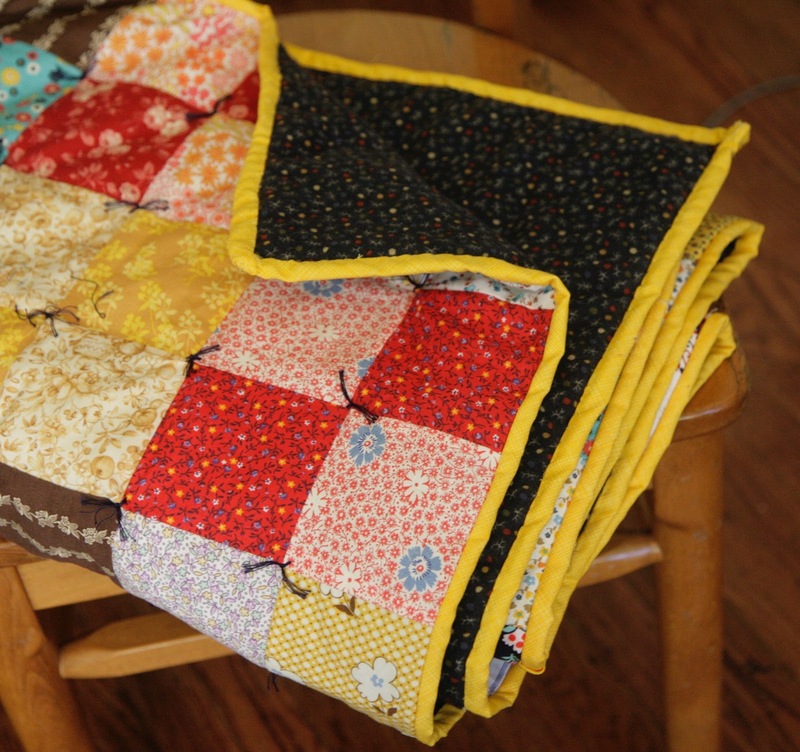 The quilt is the perfect size to lay over my lap and tuck under my feet while I sew or craft. I think it's about 48" x 56". I hope you are appreciating my little photo-bomber here! Once I finished the quilt top, I sandwiched it with ditzy floral navy flannel for the back and wool batting. Wool batting is really soft and warm, and has a higher loft than cotton batting, making it really squishy and nice for a tied quilt. 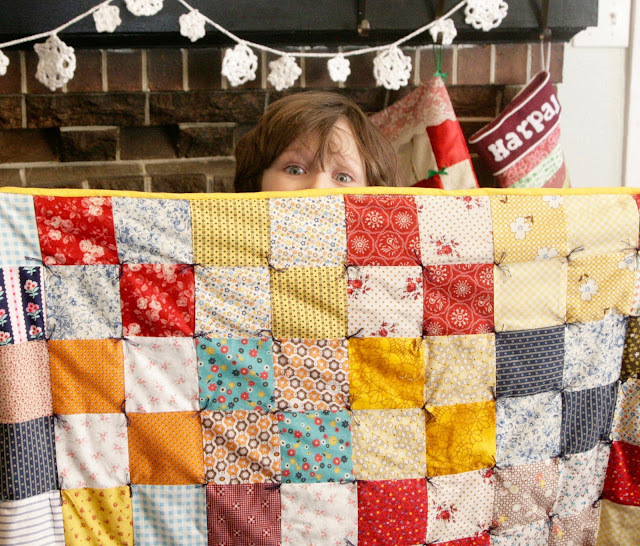 It can be washed cold and line dried or tumble-dried cool, so the care isn't that different than any quilt. I sent the quilt to my mom with a box of color-catchers because I am still worried about the dark blue flannel bleeding! I prewashed it several times, but it was still bleeding color ever so slightly - that's one down side about using flannel for a quilt backing rather than regular quilting cotton. Wait a minute, who is that peeking above the quilt? It's Joe, who gives this blanket his seal of approval! This boy loves his blankets. Our house is old and drafty, so you can often find Joe wrapped up in a blanket while he plays on his tablet or works on a lego project. He knows a good blanket, and the squishy loft and warm flannel back is just his style. 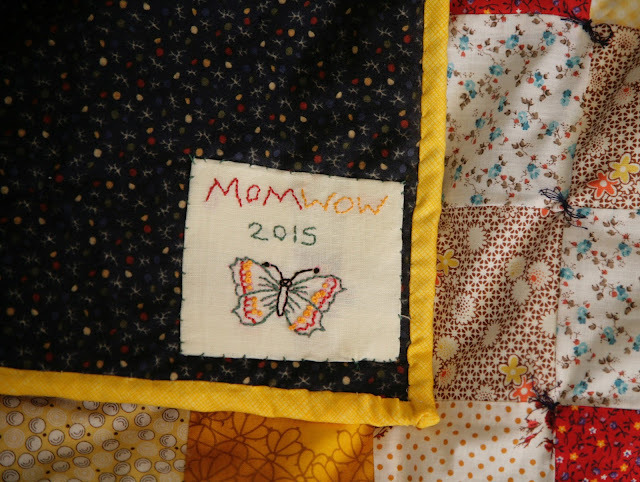 I finished the quilt with a little handmade label. My mom signs letters and emails MOM WOW - you know, it looks the same upside and backwards - that's my mom! So that seemed appropriate to embroider on some cream linen to make a label. I also used one of my large collection of embroidery transfers for the butterfly, and stitched the label down with embroidery thread. I had hoped to have this blanket in my mom's hands by Christmas, but life being what it is, that didn't happen. This will go in the mail on Monday. Hopefully the special-ness and work involved helps to offset the lateness! Love you, mom!!! Merry Christmas, and God Bless Us, Everyone! Aw! What a great gift. 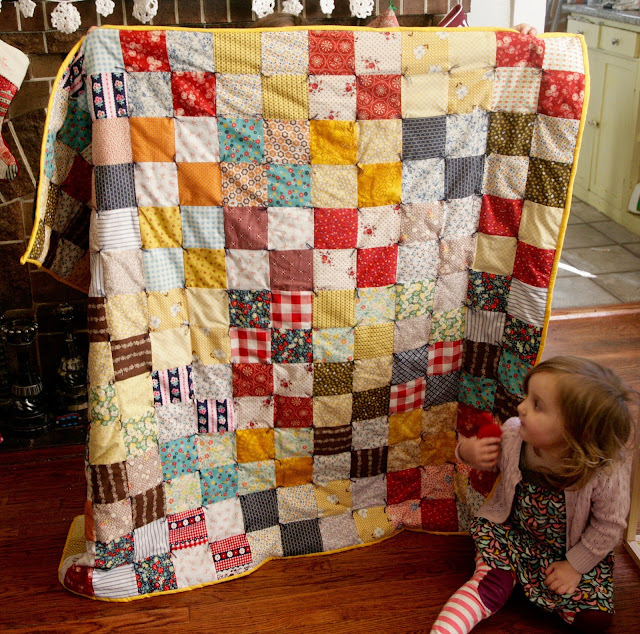 It sure looks like the perfect cozy quilt for curling up on a couch this winter. I love it! It is so cheerful and cozy. 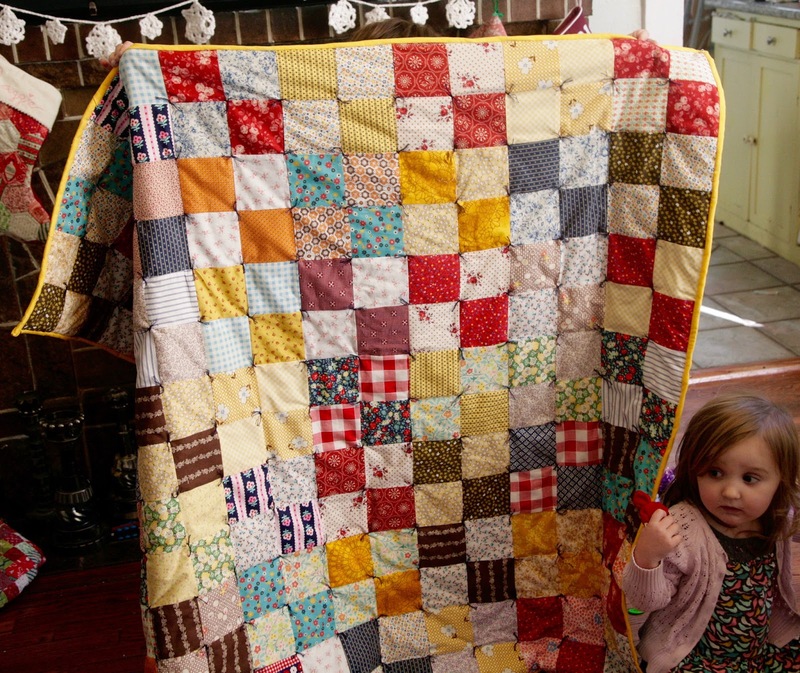 I said after I saw your last quilt that I really wanted to make one and now I want to make one even more!! I really love the colors in this quilt! It looks so cozy! I haven't ever used wool batting in a quilt before. I'd like to try it sometime for that extra layer of squish. I hope your mom loves it! I love it! What a lovely gift for your mother and I'm glad she found another place to live. I didn't realize she was up here in my area. And I think it's perfectly okay to call it a quilt. I guess "tied quilt" would be what my grandmother would call it, and she was a huge quilter of all varieties! Oh man, I feel you on Christmas gifts. We started initially doing handmade only, then small gifts, and now it has just grown and grown to epic proportions. I forget what I've already gotten for each kid, since I am a wrapping procrastinator. Then I order more gifts for one kid to make it more 'fair' and then it grows from there. We don't really buy gifts for our kids at other times of the year outside of birthdays, so on one hand I enjoy surprising them, but on the other hand it just feels a little much. And gifts that would normally wow them get laid aside for bigger ones. I don't know - I feel like I'm always struggling in this area. Anyway, you are incredible! I can't imagine just whipping up a quilt. And YES hand tying takes freaking forever. I did it for my midwife on a whole cloth quilt thinking it would be fast and it took 4-5 hours. I'm so sorry that she couldn't make it to your house for the holidays, but I bet she loved this quilt. It looks so comfy! It must be all the love sewn into it. Also, MOMWOW is kind of awesome! 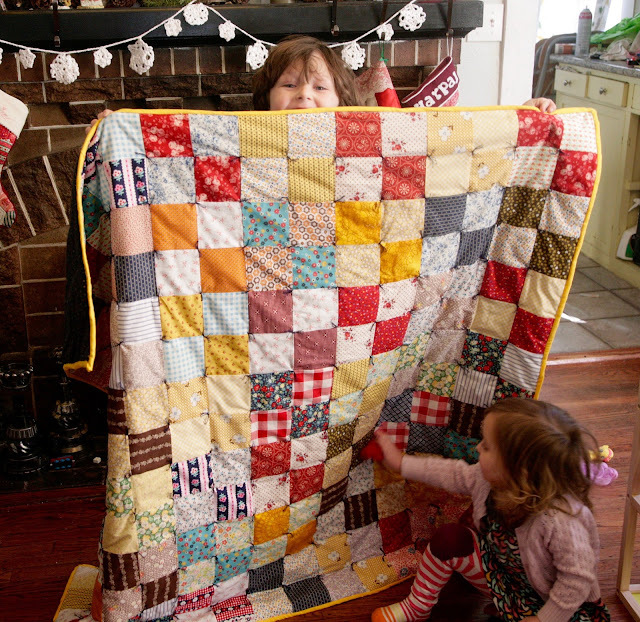 That is one sweet quilt! Keep your lamp trimmed and burning.